Having been a reviewer of sample instruments for nearly a decade, I’ve noticed that it is the simpler products that I return to the most when I need a certain type of sound or texture. This is partly because I know I’ll be able to work quickly without having to wade through presets and pages of parameters, but also because I remember exactly what those products sound like. Microrgan, I suspect, will be one that sticks in the memory. 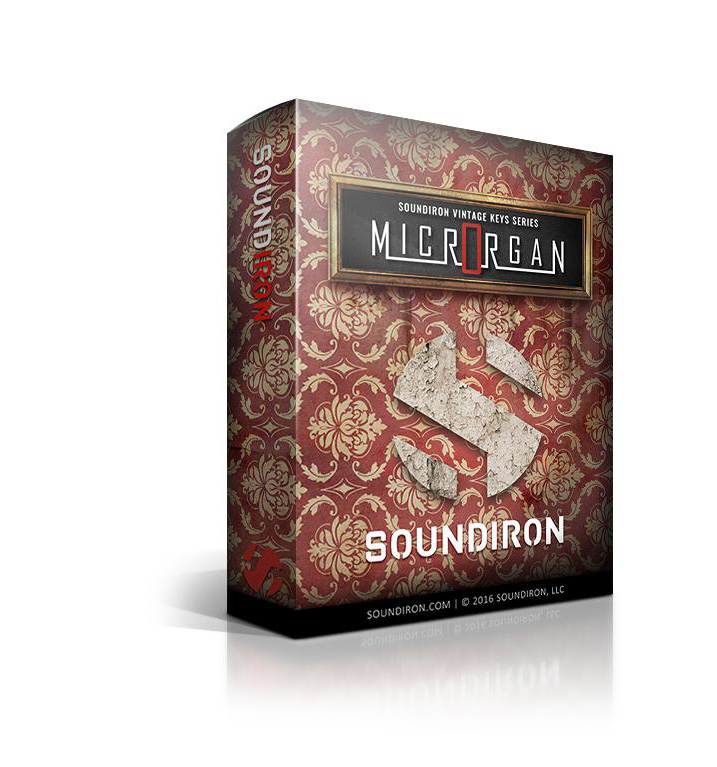 It does benefit from Soundiron’s standard 10-slot rack for effects and processors, offering a fairly vast set of sound-shaping possibilities, but essentially it is a fairly straightforward instrument, based on an obscure 49-key reed organ that was made some time in the 1950s. My guess is that the source instrument was widely used back in the day, because its sound instantly conjures up thoughts of low-budget ’50s sci-fi and horror movies of the kind that Roger Corman might have produced. Its distinctive reedy timbre doesn’t lack presence, yet it is strangely mellow at the same time, which lends itself to playfully discordant compositions of the kind that are so typical in old sci-fi and horror scores. These associations have not gone un-noticed by the interface designer, who has rendered the main control panel so that the organ appears to be against the wall of a Victorian parlour! On the top of the virtual organ are rotary controls governing Volume, Attack, Release, transient attack (Offset), Vibrato and a kind of octave-interval overtone generator (Octave). Just below these is a very effective Glide slider, with a range that goes from legato to extreme portamento, and next to that is a little menu panel that selects between a keyboard of sustained notes, staccato notes and sound effects. Alternatively, these can be selected using keyswitches at the bass end of the keyboard. At first, this appears to be all the controls that there are, but hidden behind a virtual panel that has been rendered to look like an old picture frame is a swathe of parameter adjustments controlling LFO, Filter and Arp (arpeggiator) effects. The LFO section offers five standard waveform shapes, a menu of parameters that can be targeted with the LFO, plus controls for tempo-synchronization, modulation intensity and fade‑in time. Microrgan’s Filter can also be routed to various parameters, and it has a menu of ‘filter types’ to choose from. In particular, some great results can be obtained by adjusting the Filter’s 10-step sequencer graphic columns into different formations and tweaking the effect’s cutoff frequency and/or resonance, and then the whole setup can be left to warble away on its own by selecting Hold mode in the Arp section, and giving its own eight-step graphic some shape. Overall this is a nice-sounding instrument that offers a lot of sound manipulation options, yet still qualifies as simple-to-use. It’s also inexpensive, and if your HD is filling up, at 655MB, it’s an attractive size too. Now, is anyone working on a low-budget 1950s-style horror film that needs a score?